Exterior masonry fireplace with gas logset adjacent to a covered deck for a comfortable outdoor living area. Thomas Residence, Lot 15, Arrowhead, Eagle County, CO; 12,500 s.f. ; 2010. Contractor: Alpine Mountain Builders. This 10,000 s.f. home is a wood framed residence with some log structural elements. 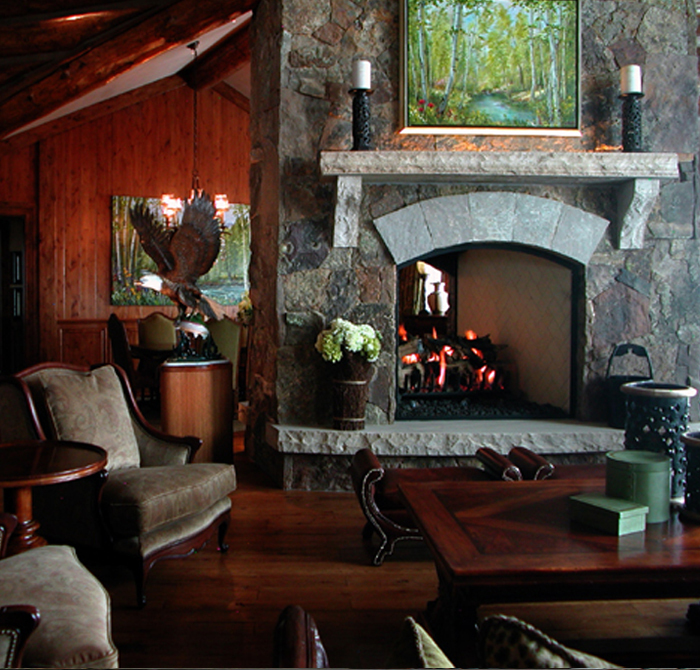 Traditional materials of a mountain home are used to compliment the design such as a moss rock stone veneer and log siding. This home boasts views to Arrowhead Village and the adjacent Cresta ski run. The Great Room design has a large see-thru masonry fireplace between the Living and Dining as well as a two-sided walk-behind bar between Living and Hearth. The home consists of 6 bedrooms, 6 full baths, 2 powder rooms, Office, Theater, and large lower level Family Room. The patios are mostly covered to create outdoor living space, which includes a dining area and outdoor sitting area with fireplace. The spa is surrounded by a cascading water feature.